MAI | Maerker – Fix my -german- street. Maerker – Fix my -german- street. Maerker is a web-based application that lets the citizens of Brandenburg report issues with the infrastructure of their municipality. 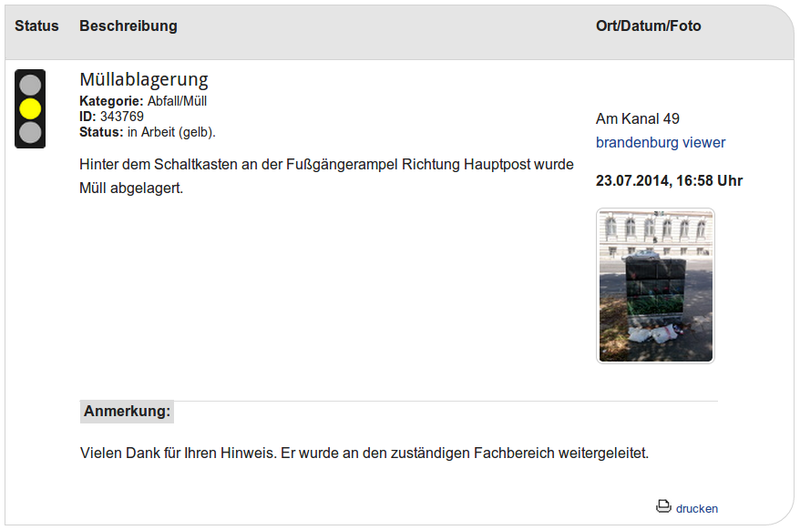 The project is already available for about 60 communities in Brandenburg, including Postdam, the state capital. Recently the project has been also implemented in Berlin, where three out of its twelve boroughs offer Maerker services as well. It is a simple system that lets the citizens participate actively in the administration of their municipality. Maerker forces the bureaucracy to react in an open way to the request of the citizens. The answers to the issues submitted fosters better coordination between institutions, giving to the actual concerns of the population the highest priority. There is a wide variety of problems that can be reported. From illegally disposed waste through to road damages or failures in traffic lights. The local administrations provide feedback about the report’s current status. With a traffic-light like system it is possible to identify the current status of an issue. Red means that the issue is pending to be reviewed, yellow shows that the problem has been identified and is in process of being solved. Green represents a problem fixed. The idea of Maerker comes from fixmystreet, a pioneer in the field. There are however some important differences. 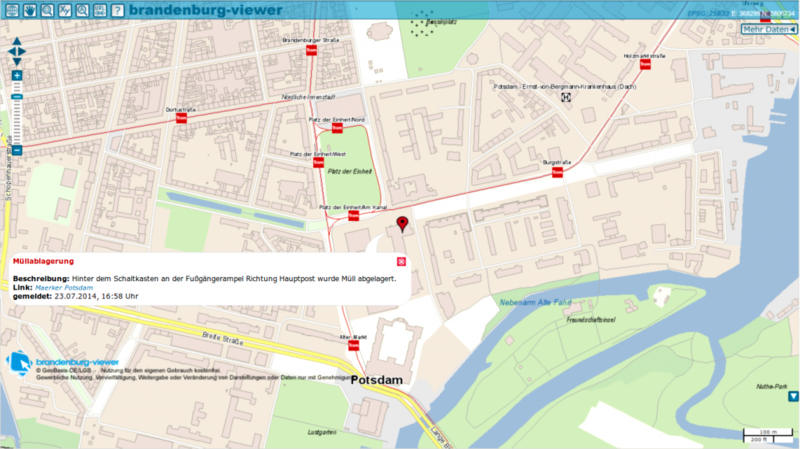 While fixmystreet is a private organization that doesn’t have direct influence in the local administration, Maerker is directly connected to the authorities and establishes a clear channel of communication between citizens and the administrative apparatus. Achieving such a transparent and effective communication channel was by no means easy. The reality of the german administrations is complex and involves a large number of actors that should be coordinated for the system to work. In the perspective of the citizens, damages in the street should be fixed, no matter who is responsible for the issue. However finding who should do the job can be a challenge. For example, a street can be the responsibility of the town hall, the administrative district or the state. Thus, for the implementation of Maerker some cooperation agreements were reached, so that the different entities could coordinate their activities and react in an efficient way.